PMD aka Programming Mistake Detector is Java Source Code Analyzer. It is used to clean erroneous code in our java projects based on predefined set of rules. 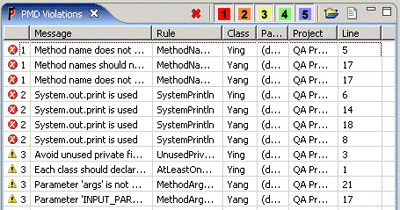 PMD supports the ability to write custom rules. Issues reported by PMD may not be true errors always, but rather inefficient code, i.e. the application could still function properly even if they were not corrected. Cut and Paste Detector (CPD)– a tool that scans files and looks for suspect code replication. CPD can be parameterized by the minimum size of the code block. Possible bugs —Empty try/catch/finally/switch blocks. Dead code —Unused local variables, parameters and private methods. Over-complicated expressions—Unnecessary if statements, for loops that could be while loops. Duplicate code—Copied/pasted code can mean copied/pasted bugs, and decreases maintainability. The easiest way to install PMD is by using the remote update site. Users behind firewalls should check proxy settings before going any further. If these settings are mis-configured the updater will not work. PMD also supplies a zip file for manual installation. Download the file and follow the readme. Demonstrated below is installing PMD via the Eclipse Software Updater. Restart the workbench. This will load the PMD plugin. Navigate to Window| Show View | .. If you have previously created a Java Project, skip to Step 6. Otherwise click File| New| .. Enter a project name (QA Project) and leave everything else in the default state. Click Finish. Eclipse will ask if you want to switch to the Java Perspective. Click Yes. In the PMD Violationsview notice a list of 17 violations. In large projects this list could easily grow up to several thousand. This is one of the reasons PMD allows violations be filtered by priority. Priority is a configurable attribute of a PMD rule. PMD assigns priorities from 1 to 5 and each priority is represented by a colored square at the top-right corner of the view. These little squares are actually clickable on-off switches used to control the visibility of the violations they represent. The results table itself is well laid out and most columns are sortable. It is also possible to get more detail on a violation by simply right-clicking it and selecting Show rule. PMD pops-up a dialog with information such as rule name, implementation class, message, description and an example. This feature can be helpful when trying to makes sense of a new rule or letting inhouse developers know about a particular company rule or coding convention. Review annotations can be removed anytime by right-clicking QA Project and selecting PMD | Clear violations reviews. Similarly, PMD Violations can be cleaned-up by right-clicking QA Project and selecting PMD | Clear PMD Violations. Repeated (Cut & Paste) code generally indicates poor planning or team coordination. Therefore, refactoring classes with repeating code should be given a high priority. PMD can help identify these classes by scanning the code in a way similar to PMD violation checks. The number of lines of similarity (the metrics used by PMD to match code patterns) is 25 by default and can be set in PMD’s Preferences page. We can generate two types of reports from PMD after integrating PMD dependencies with Maven and building the project. Below are the dependencies for Maven Pom.xml file for PMD.